There are three main reasons why you'd want to run Windows or Linux on your Mac. Maybe you've recently switched from one or the other to the Mac and still need to use some of your old OS's applications. Or maybe you sometimes need to bring work home and the applications you need aren't available for Mac. Or maybe you want it just because you can have it. £65 says you should at least give it a go. Of you course you can do all of the above for free using Boot Camp in OS X, but it's simply not as convenient or as flexible as the Parallels alternative. For a start, Boot Camp forces you to create a separate bootable partition for your PC install, while under Lion you're limited to using Windows 7 - which may be a pain if you want to use Linux or an existing copy of Windows Vista or XP instead. Parallels Desktop 7 does away with all this by treating guest operating systems - or virtual machines - as apps. The key benefits are that you don't have to keep rebooting your Mac into Windows to use it. It's far easier to share files, folders and disks between different operating systems. And you have the flexibility to install multiple flavours of Windows, Linux and even another copy of OS X Lion inside a separate virtual machine, which developers will find useful. Also new to Parallels 7 is explicit support for key Lion features such as Mission Control, Launchpad and full-screen applications for Windows apps. You can even apply some of Lion's multi-touch gestures to Windows. To help you get the best from other virtual machines on your Mac, Parallels 7 offers four different viewing modes: Windows mode and Full Screen mode are pretty self-explanatory; Modality mode displays the virtual machine inside a transparent window (handy for monitoring purposes), while Coherence seamlessly blends Windows and Mac OS. 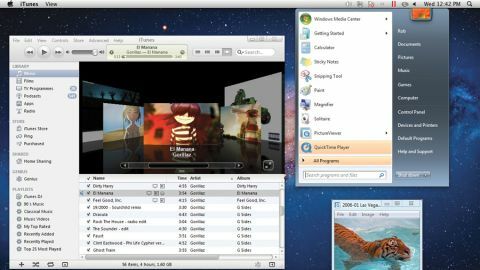 In the latter, Windows windows magically appear on the desktop, the Windows Start menu appears as a drop-down from the top-right of the menu bar, and Windows apps run alongside their OS X counterparts. It's a bit disconcerting, at first, but you quickly get used to it. In use, Parallels 7 feels surprisingly snappy and crash-free. There's virtually no lag switching between Mac and PC apps - especially in Coherence mode - and depending on the sharing settings you've chosen, opening and editing files and folders in OS X or in a guest OS is almost seamless. The only problems we came across had to do with which OS had ownership of particular hardware features of our Mac. We found we couldn't use our optical drive in OS X, for example, because Windows 7 was using it. Luckily you can easily tweak these settings in the Configure menu. 3D graphics performance has been improved in this new release, but we'd still avoid playing games in Coherence mode. There's also some support for remote controlling your Mac from your iPad or iPhone using a paid-for app, including access to all your virtual machines. Of course, the big test is if it outperforms VMWare's new Fusion 4, which we'll be reviewing soon, but so far so good.